Before we jump right into the geek speak… indulge me for a moment. Perhaps it’s summer grilling season, but I’ve got food on my mind. I love hamburgerswho doesn’t? The way I see it, I’ve got two choices when I want a burger: I can order out or I can stay in, and there are benefits to both. If I go to McDonald’s I can get a Big Mac fast and ready to eat including pickles, cheese, a sesame seed bun, and their Special Sauce. That’s incredibly convenient and it tastes pretty good. If I choose to stay home and make my own burger, however, I can create perfection on a bun. Starting with raw burger I can marinate it and add onions and spices to the meat before I cook it. Dressing the bun may include ripe avocado, thin sliced sharp cheddar, ripe tomato, and maybe even chunky blue cheese dressing (hey, it’s my perfection, not yours). It’s delicious and it’s just the way I like…but it took a lot of time to create. In my life there are times when I want the perfect burger, and there are times when a quick Big Mac is exactly what I need. This is exactly analogous to shooting RAW or JPEG in your camera. A RAW file is just like raw meat: it’s gotta be cooked before you can share it. A JPEG, on the other hand, is ready to be shared immediately, but you get a lot fewer options. Personally, I shoot RAW all the time. This gives me the control I want and the features I need. But there are some points to consider as you make your own decision. Size matters. Raw files are bigger, and they take more time to prepare to share. But they are a lot more flexible and shapable. I’ve got white balance controls, greater dynamic range, better noise control, and incredible color options. JPEGs are useful. I like a few things about JPEGs, too. The scene files and presets for color and contrast in camera can really jump start things. I also appreciate the automatic highlight and shadow recovery options. Shooting Black and White? My favorite thing when shooting JPEG is the great black and whites the camera can make and save as a JPEG. I can shoot with a red filter for greater contrast and better skin tones and its ready to go right out if the camera. (Incidentally, just about every camera I’ve picked up in the last three years, except the basic point and shoots, has options for monochrome settings including a red filter–check your manual, it’s in there!) However, I like options, so even though I set my camera to monochrome about 50% of the time so I can see black and white on my screen, I know that my RAW file will still come out in color on the computer. I just like to see the black and white image on my LCD. From my point if view, the only thing I really like about JPEGs is the camera’s Special Sauce. Being able to quickly choose presets for contrast, saturation, and sharpness is useful while shooting. Some days I like a little Landscape… or Faithful… or Standard… or Portrait. But my RAW file doesn’t show me those things in Lightroom…or does it? That’s like saying, “I make my own burgers, but I also buy Big Macs, just to make sure it tastes good.” The result of both actions is unnecessary bloating! Go to the bottommost tab in the Develop Module, Camera Calibration. Locate the default setting for your RAW file, usually set to Adobe Standard. Click on that drop down menu and you’ll find options for all the settings your camera has built in. Choosing one of these makes your picture look just like it did on the camera, with the power of RAW intact and without the extra weight of another file. You can do the same in Photoshop using Adobe Camera RAW (ACR). What’s more, you can make a preset that applies your favorite profiles during import. Like shooting landscapes in Landscape mode? People in Portrait mode? Make a preset that brings them in looking pretty from the start. 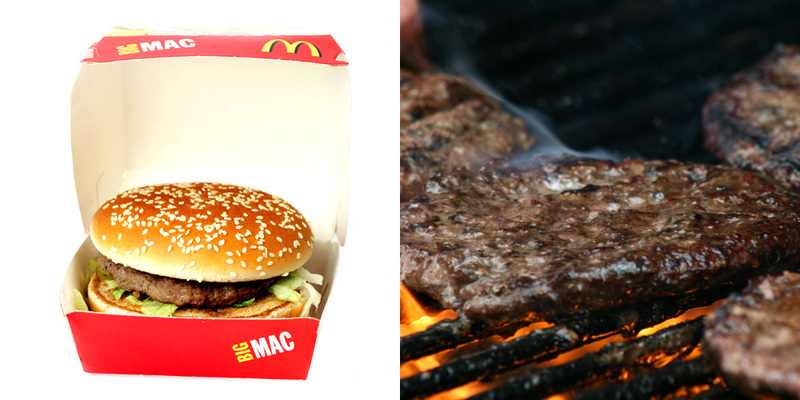 It’s like having a Big Mac button for your grill. Here’s a quick video that shows you how it all works. Disclaimer: I’ve had great success with these tips on Canon, Nikon, and Sony cameras; your mileage may vary. There are two things I’ve noticed that the Lightroom and ACR settings don’t include. First is the automatic highlight and shadow recovery, but you could add these to your preset using the Shadows and Highlights sliders in the Basic tab. The second problem is that the sweet monochrome from the camera is not an option. So, whenever I want those great black and whites without processing myself, I will choose the RAW+JPEG option, but that is the only time I find it worthwhile to do so.